Summer days are definitely gone around here…it’s freezing outside! 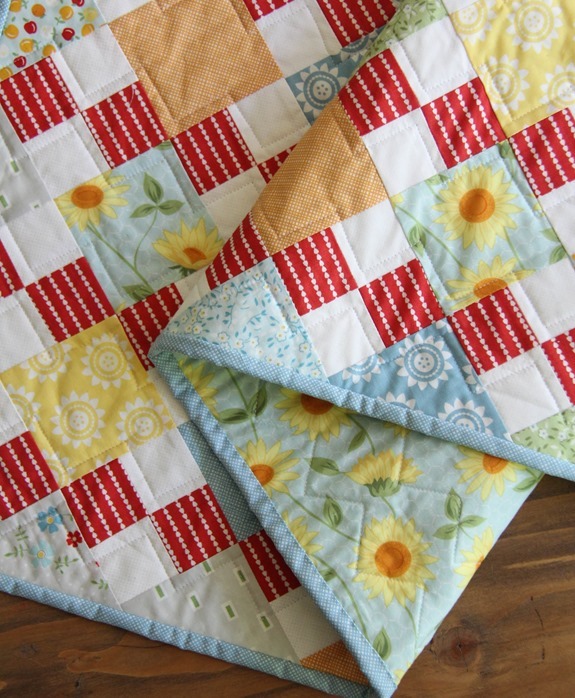 If you pick up the latest Quilts and More magazine you’ll find some summery projects made from Oh Clementine. 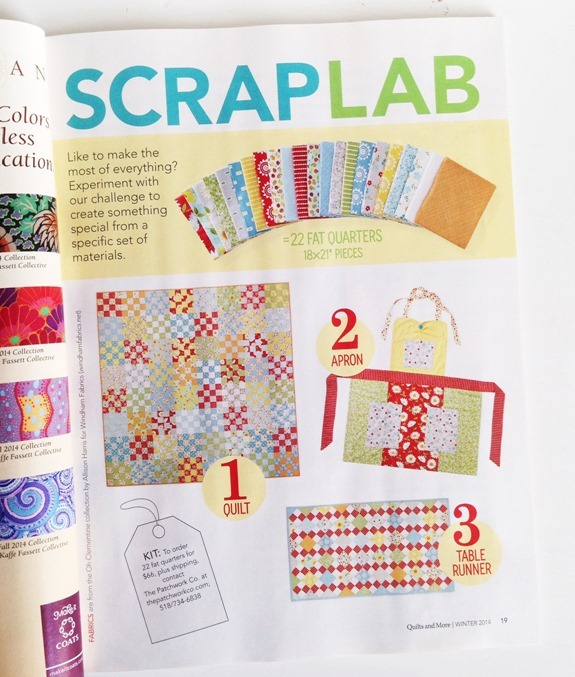 There is a quilt pattern by Carrie and an adorable apron by Patty in it, along with some other great projects (love the sewing caddy Monica!). 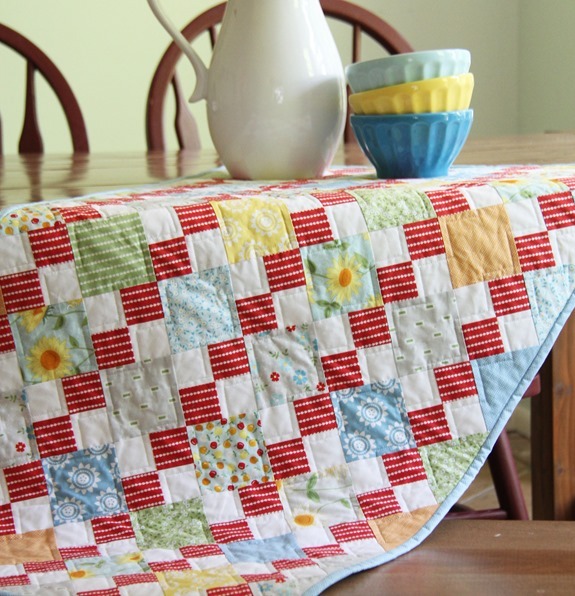 You can find a free pattern for this table runner on the All People Quilt website here. You can still find Oh Clementine in Quilt Shops, or bundles here, and here. Oh that sounds perfect (from someone whose babies are now in their 20's) enjoy every moment it really does go fast. PS the dog is so cute too! What a laugh I had over your post! It does go so fast, mine is 19 already and in the Army. Some day you will wish you could turn back time. Got some great Dinner Rolls from stratch from Mellisa K Norris webpage. Plus CrockPot chicken: Several chicken breasts, Package of Mushrooms, Couble cans of Mushroom and Chicken Soup Condesed and turn on High. Dinner! Too, too funny! I laughed out loud at your description. Enjoy those cuties. OMG Allison… I love your dog!!! What a darling picture that last one is! And- what kind of puppy is that? Enjoy every moment with your kids. It changes so fast. Last month I got to visit 2 of mine out of state and the best part of the weekend was eating Chinese take-out and watching Mulan with them. It was great. Hey, Mulan is my favorite Disney Princess. We are telling you the truth….it does go fast….enjoy! Ha ha! I don't have any boys so I don't know the joys of potty humor, but I can only imagine! I picked up some extra of that red seed stripe a few weeks ago. I think it will make a pretty binding for a future project! Darling table topper and one I can make right away…thanks for the inspiration!! Darling kiddos too and everyone is right…you're gonna miss this! 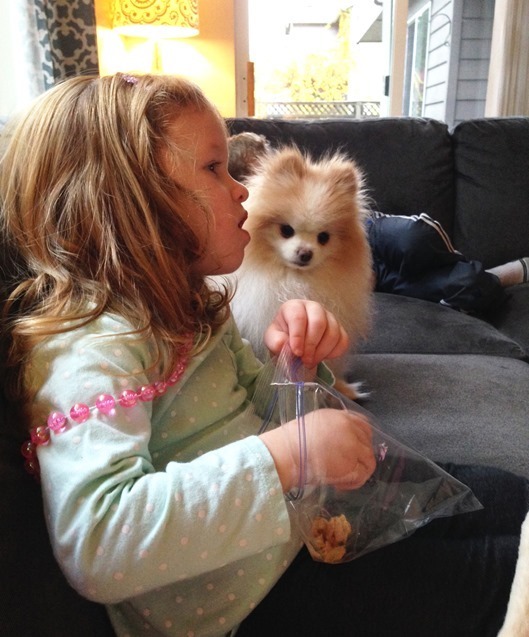 I have been caught watching Disney movies…lol with no little one around to blame it on…haha! I have not seen Frozen yet…better steal my little niece for the day and get caught up on my "movies". Nothing better than snuggling with little ones and my imagination is making me chuckle at the potty noises…LOL! I was not ready for my empty nest and it took me quite a long time to remember what I used to do…! But the years go by and all of a sudden you have the most precious grandbaby ever! :)! Life is Good! I love this table runner so much I just ordered the fabric so I can make one too! Oh I just love these summer colors and simple designs! Gorgeous! I just got the magazine today and your spread looks great. I think that table runner would look awesome as a doll quilt. Thanks for the great ideas!